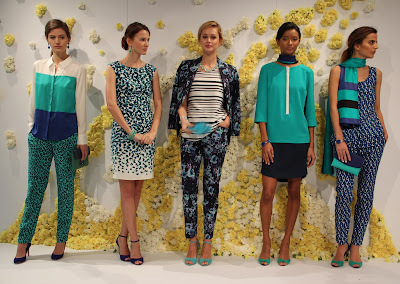 Ann Taylor Spring 2013 is here, with bright feminine florals, colorblocking and bold colors like two of my favorites - red coral and mainsail blue, against black and white prints. The collection also features stripes, paisley and animal prints. I'm crazy about the shoes this season, especially the ones I just bought - the Perfect Colorblocked Patent Leather Black Heels and the Perfect Printed Leather Pumps in Ceramic Blue, which has a unique stingray texture. If the Kelsey Suede Ankle Strap Heels in mainsail blue were available in my size, I would have gotten them too!